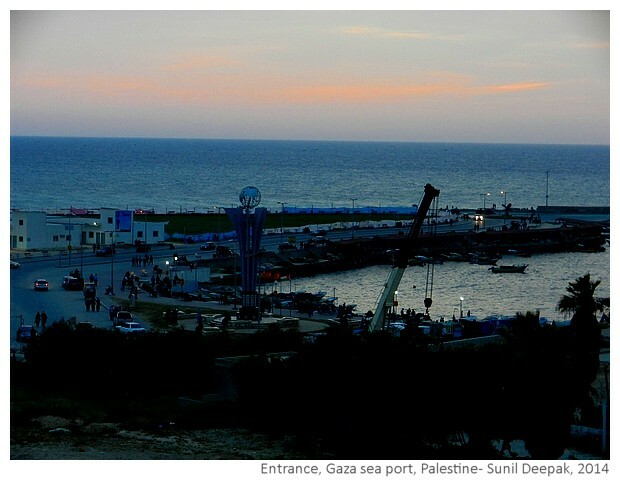 I am in Gaza city in Palestine, and I am staying in an apartment in front of the sea port of Gaza called El Mina. 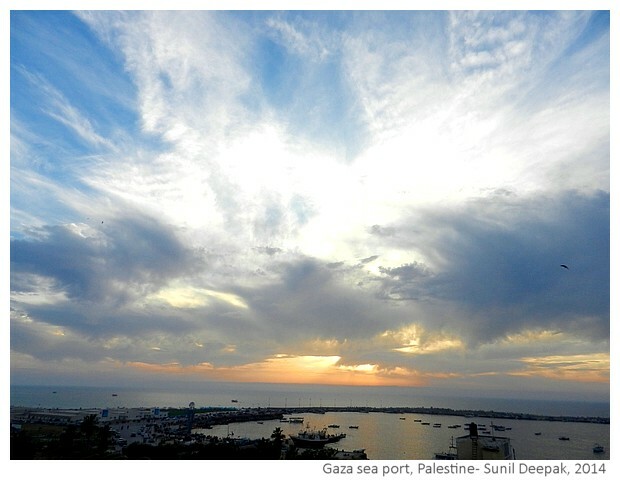 This is a photo-essay about the Gaza sea port. 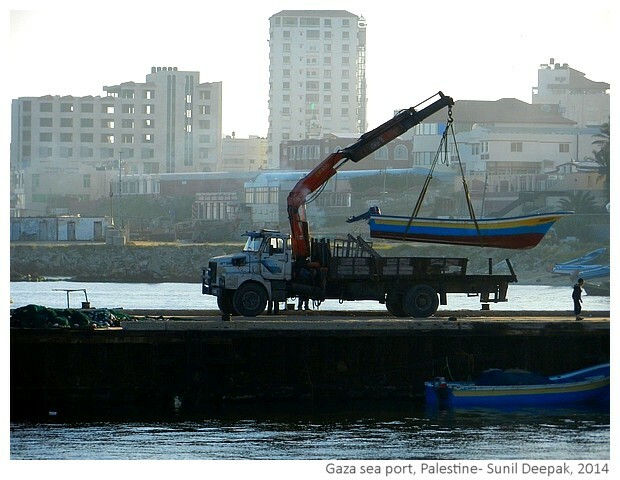 Stories about the sea port in Gaza go back to antiquity. The port is like a "T" with the long vertical leg jutting out from the coast into the sea. As you enter the port, there is a monument with a round globe at the top. 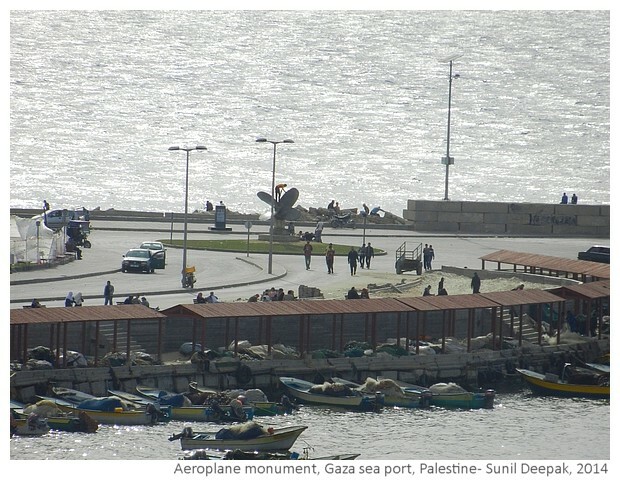 It has some names at the base along with the Turkish and Palestinian flags. 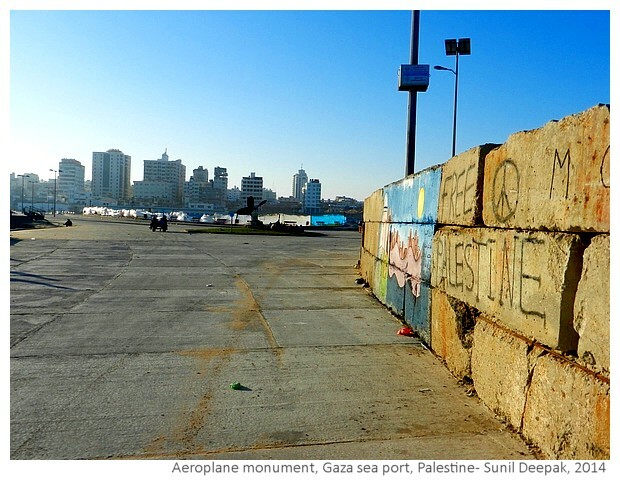 It was built by Turkey to commemorate the Turkish ship Mavi Marmara and activists who had tried to force through the Israeli blockade of the port in May 2010. 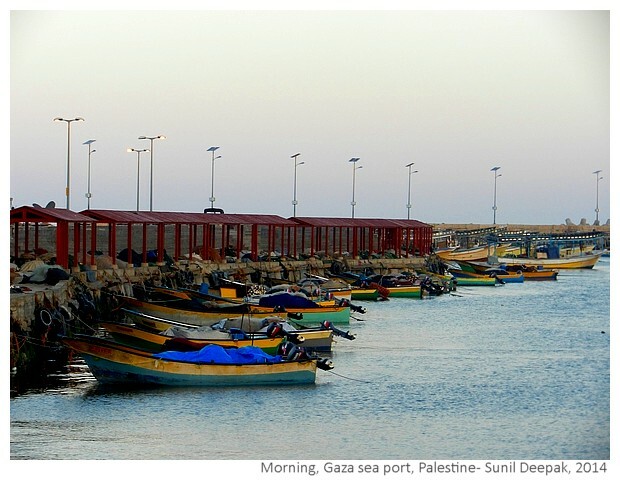 As you walk down the vertical leg of the T, on the right side there are red-roofed sheds for the fishermen. A few days ago, one early morning, before 6 AM, I went down to take a walk at the seaport. It was absolutely marvelous. There were few people and boats were coming back with the fish they had caught. 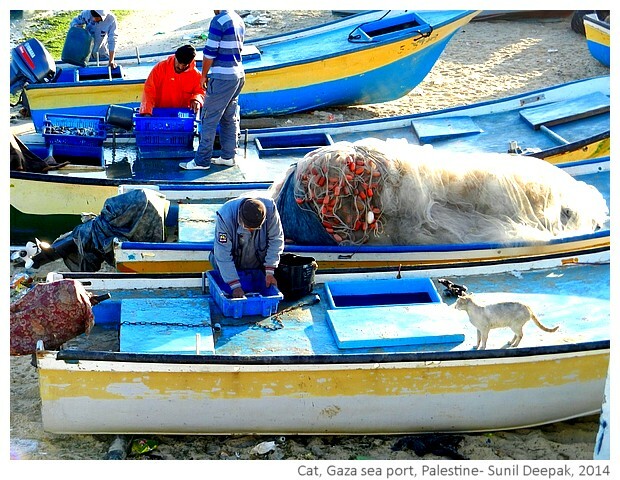 In the boats, men sat around sorting the fishes and putting them in plastic crates. Other men took the crates and piled them in carriages run by horses to distribute them in the city. 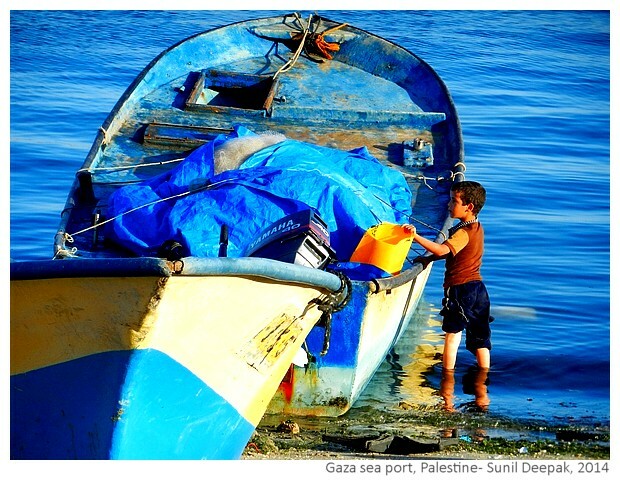 Parallel to the vertical leg of the "T", there is another thin strip of land going into the sea for the bigger boats. A truck had brought a new boat and was putting it down. 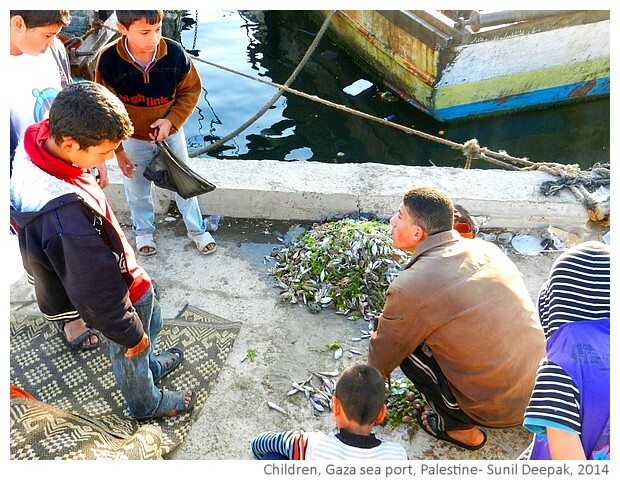 Cats and young children from poor families with plastic bags stood around the fishermen, waiting for fish scraps. If they came too close, the fishermen glared at them and they retreated. But the fishermen were not too hard on them. Every now and then, someone took pity on the cats or the kids, and threw a torn or headless fish at them. 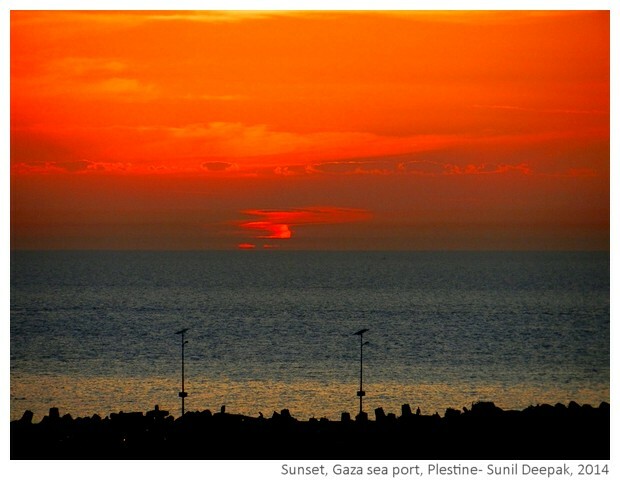 The horizontal leg of the "T" on the left, it continues with the beach of Gaza. On the right side, it goes and ends suddenly in the sea, creating a small bay. If you stand at the tip, in a distance you can see the long chimneys of some industrial plant spewing smoke in the sky. 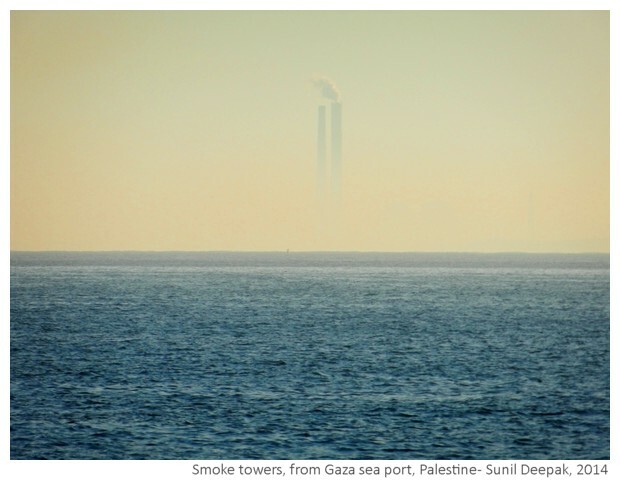 Those chimneys are on the Israeli side of the border. 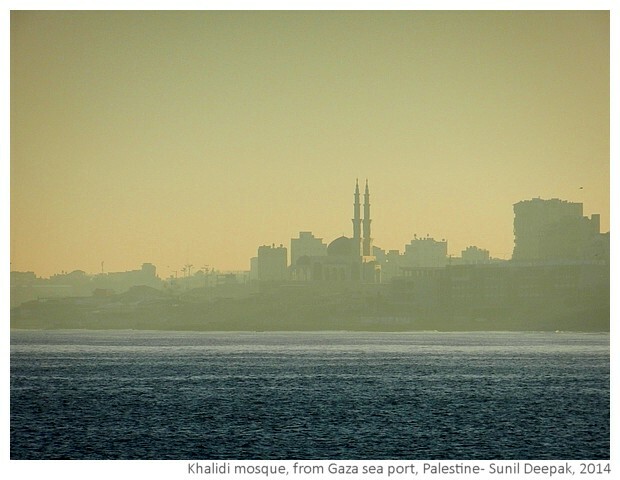 On the skyline of Gaza, you can immediately see the new and the beautiful Abdul Aziz Khalidi mosque, built by a rich Palestinian, who lives just across from the mosque, in the memory of his father. 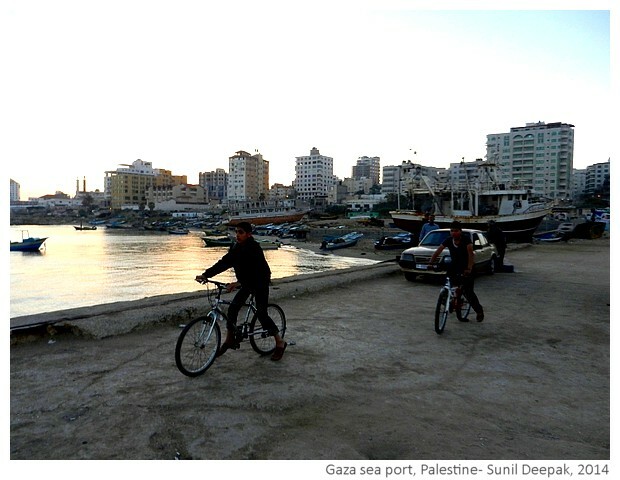 Next to the mosque is the "Beach camp" or the Shati refugee camp. 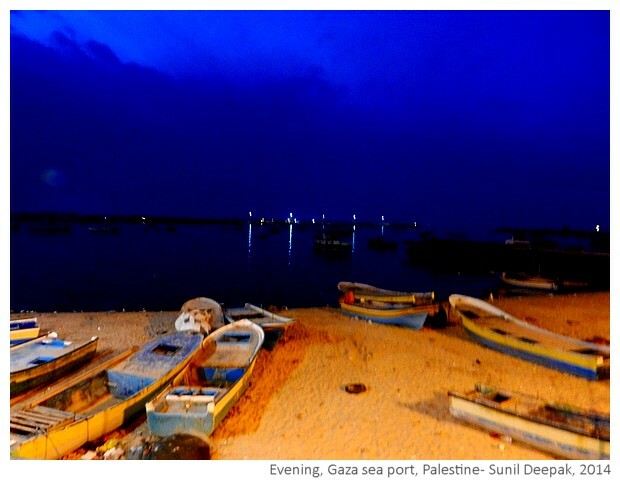 They are widening the road along the seacoast of Gaza with money from Qatar, so soon, the Beach camp will disappear and hundreds of families living there will be shifted to the south of Gaza city. As the sun came up, I walked to the tip of the land that protects the port. 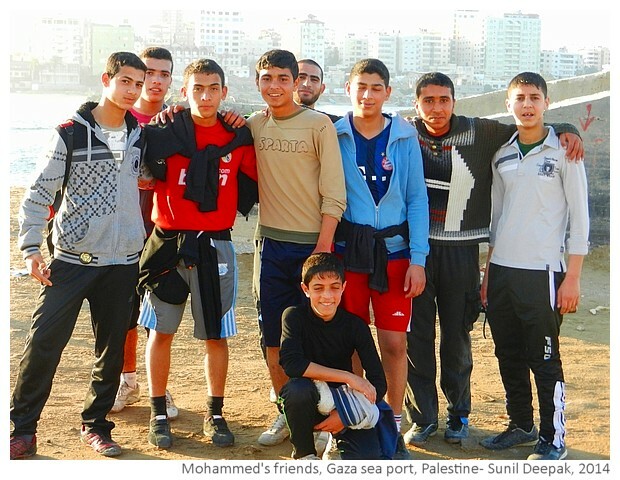 There I met an adolescent boy called Mohammed, whom I asked to take my picture. Soon we were joined by a group of his friends who all surrounded me. “I am Hindi” I said, and suddenly we were friends, many of them smiled. 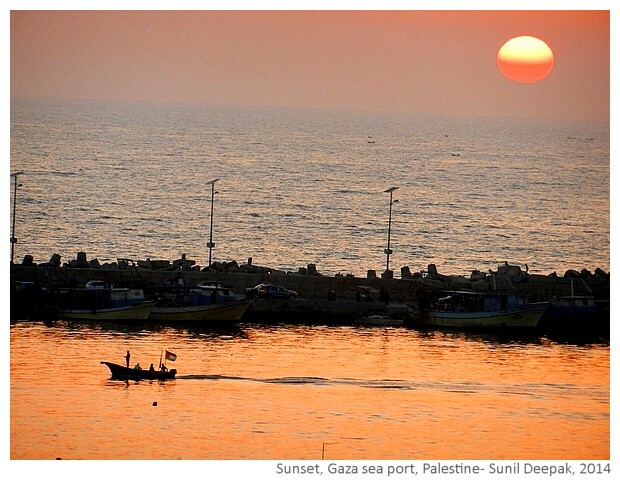 I already knew that in Palestine, they do not understand if you say "India", for them India is "Hindi" or "Indi". 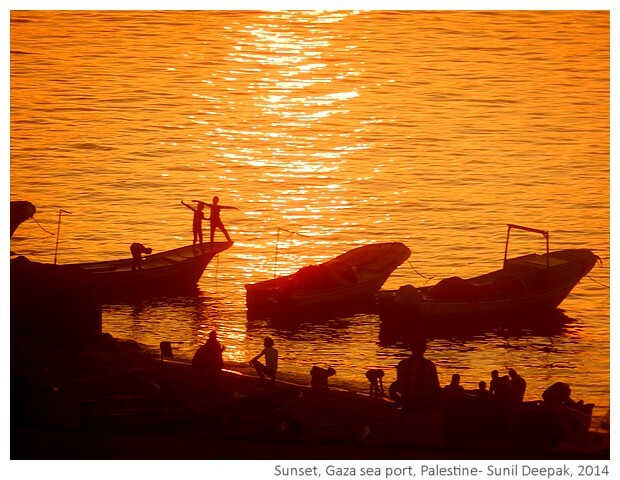 Bollywood is well known in Palestine and many persons have told me about their love for Indian films and how these make them cry and how much they like Amitabh Bachchan! 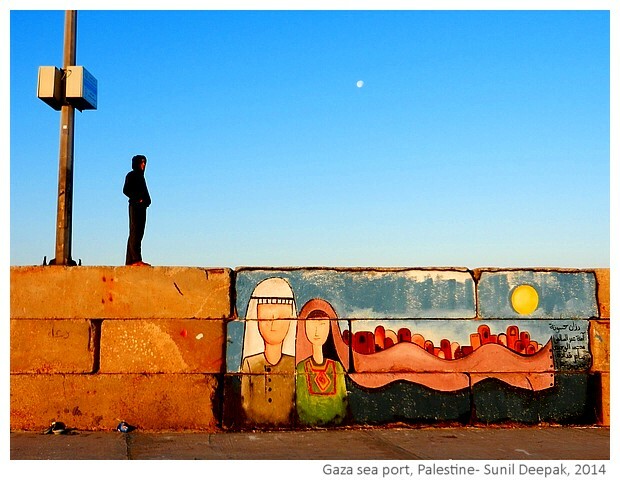 At the port, in the morning most persons are male, you hardly see any women or girls. Children are every where, some playing and others working. That morning walk, it was a wonderful experience. I was back at the port, one evening as well. In the darkness, it was quiet and peaceful. It is beautiful to wake up in the morning and see the boats come alive and see the sky change colours. In the evenings, often I sit in the balcony with a book and look at the sun going down and the persons walking around the port. Here are a few images of the morning and evening at the port, taken from the apartment. As I write this post, occasionally I glance out of the window at the port. Today, dark clouds are hanging low and the water has a silvery-leaded sheen. It is deserted. Except for an occasional boat that leaves a soundless trail on the water, it can even be a painting that I am looking at. Last night it had looked so crowded but then it was the Friday night! On Friday evenings, the seaport is like an ant hill, full of people, more persons joining them from all the sides and cars blocking the road, parked till the end of the tip of the port. The picture below, shows the apartment building on the right, where I am staying. 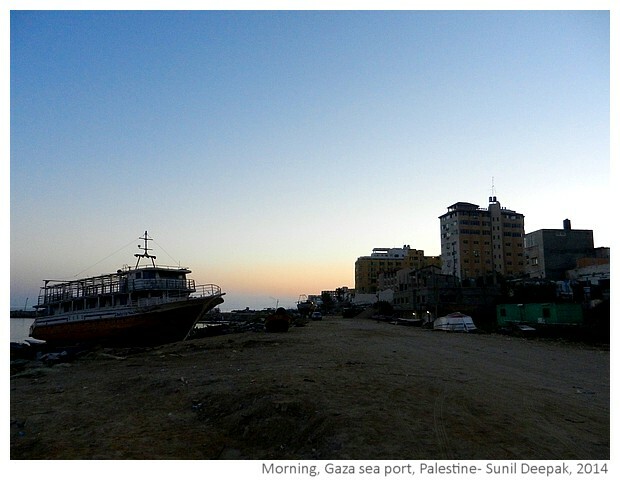 To conclude this photo-essay, here is another image from my early morning walk at the port of Gaza. 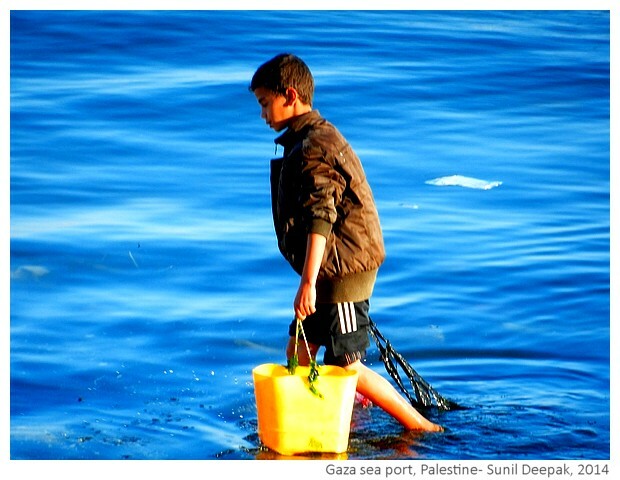 The word "Gaza" brings on images of Palestinian struggles with bombs and wars. In these days, I have met so many Palestinians who seem tired of wars and bombs and who dream of decent lives for their children. This post is dedicated to them. Nice pics & write up. Kyaa baat hai!